Having control over who can access different content items means you no longer have to worry that the wrong person might get their hands on something they shouldn’t. So when it comes to setting up proper team roles, you can now be sure you will enjoy a smoother content experience. Since summer 2018, you have been able to customize the roles within Kentico Cloud to limit content access according to your team’s roles. And being able to do this forms a critical part of content collaboration. As the person responsible for the web or other digital projects, you want to feel confident that nothing gets deleted or published by accident, and that means keeping your content safe and avoiding anything getting broken. Plus, this prevents team members getting confused by content or functionality that is not intended for them. As we have updated many of the capabilities you can set for your roles since their initial release, we wanted to share with you some of the things you can achieve with our new features to give you an idea of how you can align your Kentico Cloud projects with your team’s processes. In this blog post, we will look at custom roles from two angles: What sort of roles you can create within Kentico Cloud and what some of the capabilities you can set are. So, let’s kick things off with specific roles. In a nutshell, you can set up any role, but I would like to focus on two typical ones and demonstrate the flexibility they offer. This could be someone you outsource to or perhaps, even an internal copywriter that's external to your immediate team. This role is for someone who helps you out by writing specific content, but because they work from outside the team, you do not want them having access to the entire content inventory. It's more likely you would only share the content they should be working with and only for the period they are working on it. Aka, the “busy approver”, this role is for someone who can only approve content and comment when something is wrong. But from a permission standpoint, they are not allowed to change or even publish the content—either legally or otherwise. As this role tends to be busy, it is a bonus that they can only access the content requiring their immediate attention. If you would like to see how you can use these roles in greater depth, we have prepared a thorough article to walk you through all the steps you need to take to configure a typical, yet more sophisticated, production workflow and the custom roles, as introduced in this blog post. If you are more a feature-savvy person, here are some of the most requested capabilities that you can give your roles. You can limit the roles that can delete content. No more “oops, where’s my content”? 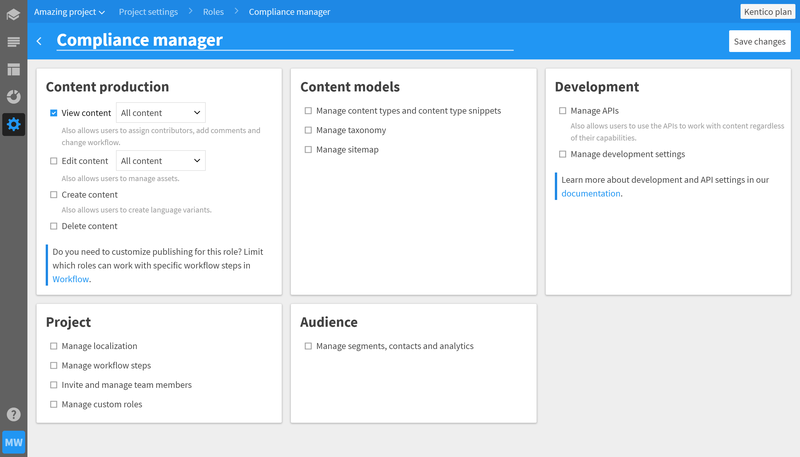 You can also limit workflows according to which roles are allowed to “publish” or “schedule to be published” content. No more “leaked content that wasn’t approved”. This means you can arrange for content that was at Copywriting stage to be sent only for Review and nowhere else. No more “skipped steps or missed approvals”. As mentioned earlier, this is the functionality you can use to restrict access for external copywriters or compliance managers. No more content “falling into the wrong hands”. This is just the tip of the iceberg of some of the most requested capabilities. Check out the app to explore all the advanced custom role options available to you. Alternatively, take a look at our step-by-step guide on how you can configure a certain workflow to see all the options available to you. Remember, if you're missing any information, let us now in the chat. Please note, the availability of roles is based on your pricing plan. P.S. If you're not already on Kentico Cloud, but like the sound of Custom Roles, get started with a free 30-day trial today!